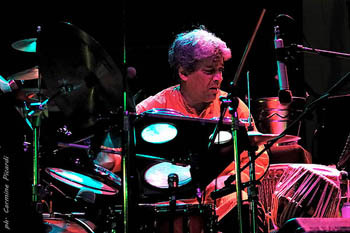 Creating the "Indian Subsonic Bass Sound"
Back in 2000, I'd been completely blown away upon seeing a rather scintillating, "Trilok Gurtu & the Glimpse" show, at Yoshi's in Oakland. 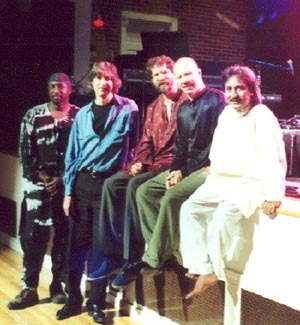 Touring in support of his "Kathak" album, Trilok also featured the incredible bass genius, Kai Eckhardt; their rendition of Trilok's "Seven Brings Return" is still among my very favorites. Somehow, I had the incredible fortune of getting the front table, and to see Trilok's unique, "Indian subsonic bass" kit in action, up-close and personal. Now I'd seen Trilok plenty of times before, but never quite like this. To make things even more interesting, the tabla master, Zakir Hussain was also in the audience that night and actually leaped onto the stage during the set, to join Trilok in an absolutely mesmerizing and unbelievable duet for the ages. Indeed, I'm no stranger to Trilok and his incredible music; from his work with Oregon, ("Ecotopia", "45th Parallel", "Always, Never and Forever"); his duets with Joe Zawinul; the incredible trio with the aforementioned Eckhardt and the incomparable guitarist, John McLaughlin; his Arkeology group with Jan Garbarek; to his great solo albums; including his latest, "21 Spices" with Simon Phillips & orchestra, to name but a few. I've always been fond of that blend of Indian-jazz-world music, dating back to Shakti, Ravi Shankar and even my earlier work with the wonderful bassurist John Wubbenhorst and that "irascible" tabla player, Sandip Burman; both exceptional players and masters of playing odd-metered ragas. It was Wubbenhorst and Burman who afforded me the opportunity to perform alongside one of my longtime idols, the incredible pianist and harmonica player Howard Levy, and another hometown friend, guitarist Paul Bollenback. Those sounds, groups and experiences only whetted my appetite for even more. It goes without saying that Trilok Gurtu is one of my all-time, favorite percussionists, yet it is also the unique sound of his drums that equally astounded me. They were basically these two, 2" flat, metal or wooden pieces with 6" or larger holes punched out of them; with each hole covered with the appropriately sized drum head. Somehow, these things sounded simply incredible; deceptively small, yet surprisingly full. They still had a degree of warmth and didn't "clang" like the smaller, metallic demons known as Remo's "Roto-toms". The Rotos were full of attack; but they didn't have the combination of both attack and subsonic bass sound that the Trilok kit had. If the Rotos "clanged", then the Trilok drums "clacked", with a deep-dish helping of bass tom sound thrown in. Ironically, my search for a subsonic drum alternative however, brought me back to the world of drummer Bill Bruford and the British percussionist Pete Lockett, via their "Network of Sparks"; an all percussion album with Lockett at the helm. 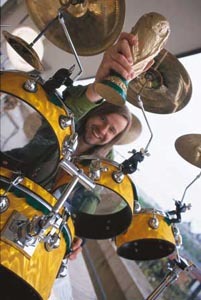 I discovered that like Trilok, Lockett also played a rather unique kit. Although Lockett sounded fabulous on his kit, his drums were nothing like Trilok's in shape or size; the only similarity perhaps, being the drum head sizes, tabla and choice of cymbals. Lockett did however, employ a variation of the elusive "Indian subsonic bass sound". Unfortunately, it didn't quite have that unique "cajon" sound, and reminded me at times of a more conventional kit. Admirable as it was, it still wasn't it. One day, during my front-of-house engineering days at the State Theater in Falls Church, Virginia, I actually came across a rider and stage plot for Trilok and his band, detailing his desire to mic the two subsonic drums, and EQ them to favor the bass frequencies. I always knew amplification played a role with those drums, but I had no idea how much a little bit of EQ could turn a few muffled, semi-slack heads into one of the coolest sounds I'd ever heard coming from a drum. 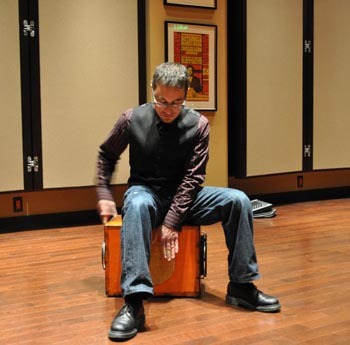 "If you have ever had the pleasure of seeing Trilok Gurtu, Johnny Kalsi or Pete Lockett play their version of a western drumset, you can't help but be struck by the sound of the kick drum (usually played by the left hand). There is a little secret to how that sound is achieved, one could argue that it ignores the conventional tone generation principles of the head delivering the tone. In fact it is working below the lowest tuning point of the head and is subsonic in many cases. It works because the mic still picks up the low freq of the membrane movement and also a good balance of impact from the beater. It's very simple and hugely effective, the sole restriction however is that it requires to be amplified using a large diaphragm mic to function effectively. Secret revealed. Now all I would need are the drums and the amplification. I had a great little, 5" x 10" Pacific Coast Percussion snare drum already, and of course, Mackies aplenty, so I was good to go on everything, except the most important piece: the cajon-style, subsonic drums. 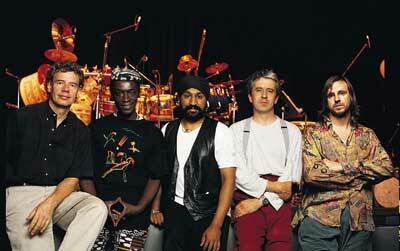 I was after the "Trilok sound", and with Remo out of the picture, the other drums would simply have to be made. 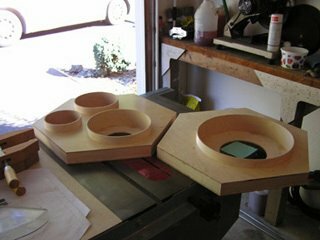 The 6", 8", 10" and 14" maple shells came via NY Percussion, and the 24" x 24" sheets of maple I got from a local lumber yard. 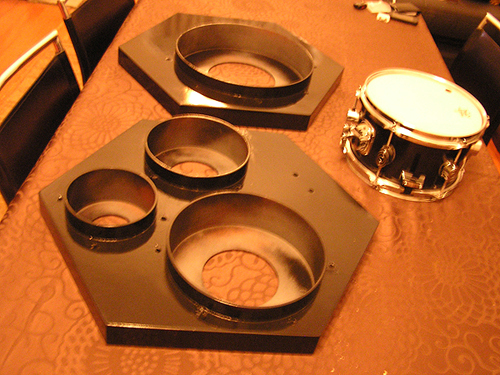 I have a 12 piece Simmons Electronic kit, and I always loved the hexagonal look, so the shape of the drum housing was actually the easiest to come up with. Kate Aragon, my good friend and bassist-turned-luthier, was fresh from her "luthier & instrument making classes" in Georgia, and agreed to take the refinishing on. Like my Zendrum and my last Drummstick, I opted to go for a glossy, black lacquer finish first. While drums were "in the shop", I did more research on the world of the "Indian subsonic bass sound". 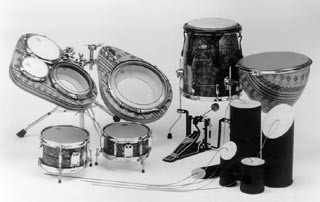 Many percussionists around the world actually employ it to some acclaim. One day I came across a shop in Berkeley that custom made cajons with drum heads. They only specialized in converting cajons however, yet they showed me I was on the right path. Later, while performing at an outdoor jazz gig with my Unidentified Flying Quartet, I saw a group with a percussionist using one of those cajons to great effect. As it turns out, he was in fact the renowned producer, drummer and artist, Pc Munoz. Pc and I hit it off immeadiately, and he informed me he was actually playing a "Marimbata"; a cajon-like box with Brazillian-style drum heads; it was not unlike Trilok's kit, except with thinner heads and played by hand. I promised him I would let him know when my drums were done, and that we would have to jam! After some wrangling with my Ultimate Support/Gibraltar drum rack set up, I finally added all of the new hardware, carriage bolts and nutss, clamps, L-rods, muffl' rings, Evans Blue hydraulic heads and rims. It was almost time to test drive the drums for feel, tone and placement. So far, so good. 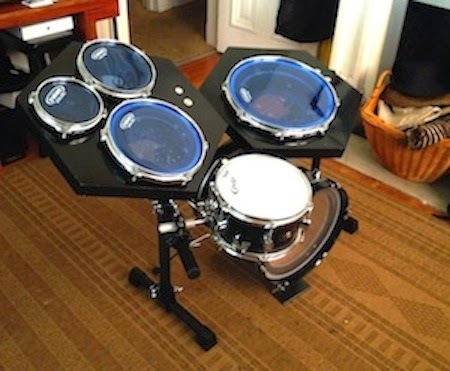 I can already visualize my cymbal and hi-hat placement, Pintech triggers and my Alesis Trigger I/O for the electronics. After a little tweaking, my quest for the "holy grail" of the Indian subsonic bass sound is now complete! Update: I've been performing with Wubbenhorst's Facing East group in the Bay Area for the last year, using my Zendrum EXP. Happily, the time has finally come to put the kit in action; One of the benefits of playing "open-handed" or leading with my left hand on the ride cymbal, makes playing the subsonic kick drum and snare with my right hand, just as Trilok does! I'll have photos and perhaps video of the kit in action soon, so stay tuned!